There are two ways you can use the Energy Policy Simulator (EPS). You may either install the required software and download the model to your own computer, or you can use the model via a web application interface on this site. This tutorial page discusses how to use the model via the web application interface. The online interface is powerful, user-friendly, and does not require you to install any software. However, the downloadable model offers considerably greater analysis capabilities. We recommend you get started by using the web interface, and if you require more advanced features (such as reporting outputs from additional variables, changing policy implementation schedules, performing batches of hundreds or thousands of runs via a script, or performing Monte Carlo sensitivity analyses), you may migrate to the downloadable version. When you first navigate to the Energy Policy Solutions website, you will be on the landing page. The page features a small amount of introductory text and three buttons: “Enter Simulator,” “Learn more,” and “Sign in.” “Learn more” and “Sign in” are located in the upper right corner, and “Enter Simulator” is located underneath the introductory text on the left. Clicking the “Learn more” button opens a web page to the documentation index. From there, you can access this tutorial page for the online model, the Guide to Smart Policy Design, and many pages of technical documentation about the model. Clicking the “Sign in” button will take you to a page where you can sign into the Energy Policy Simulator. This is only useful if you have previously used the simulator and created an account, in which you have saved your custom scenarios. If you did not previously create an account, there is no reason to sign in at this time. Clicking the “Enter Simulator” button, just below the introductory text, will take you to the web interface of the EPS. The remaining three Quick Start boxes highlight the policy scenario selector, the policy menu, and the output graph selector. These features are all described in this tutorial (below). If you wish to re-play the Quick Start walkthrough in the future using the same web browser, you may do so by using an “incognito” or “private” browsing window, which causes the simulator to believe this is your first visit to the site using this browser. The graph also shows the U.S. 2025 emissions target, which was submitted to the U.N. Framework Convention on Climate Change as the United States’ Intended Nationally Determined Contribution (INDC) in 2015. This provides a reference point as well as a goal that users might try to hit as they design policy packages. Most output graph types, including “CO2e Emissions (Total),” show only a single variable. These single-variable graphs can display a number of scenarios simultaneously. Each one forms its own line on the graph. It is not possible to show multiple scenarios on this graph at once, because each scenario requires its own set of stacked areas. Therefore, when you choose a multi-variable graph from the Output Graph Selector, the data depicted will be from the active scenario. If you wish to see a multi-variable graph for a different scenario, you must change which scenario is the active scenario, as discussed below (in the “Policy Scenario Selector” section). 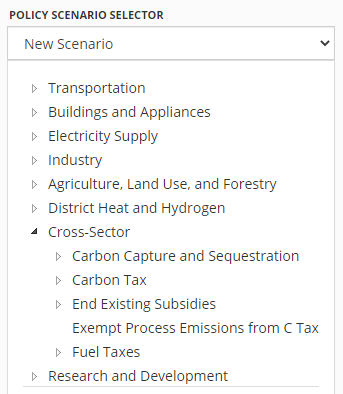 The Policy Scenario Selector is a drop-down menu near the upper left corner of the screen, above the list of different sectors. When using the EPS via the online interface, there is always an active scenario, and its name is displayed in this drop-down menu. The active scenario is the one that will be edited if you adjust any of the policy levers (as discussed below). When you first start using the EPS, the active scenario will be “New Scenario,” and it will not have any policies enabled, so it will be identical to the included “Business as Usual” scenario. Some policies only possess a single lever. For example, the “Carbon Tax” policy only appears once in the policy list, because a single lever applies the carbon tax to all sectors and fuels. Other policies are broken down into multiple levers, if they can be set separately for different fuel or technology types. For example, the “End Existing Subsidies” policy can be applied to some, all, or none of various fuels and electricity sources, such as coal, natural gas, wind, solar PV, etc. Similarly, the “Fuel Taxes” policy can be applied separately to different fuel types. Breaking down some policy levers by fuel or technology types provides increased flexibility and enables users to design policy packages that reflect their views and priorities. At the top of the pane is the name of the policy. 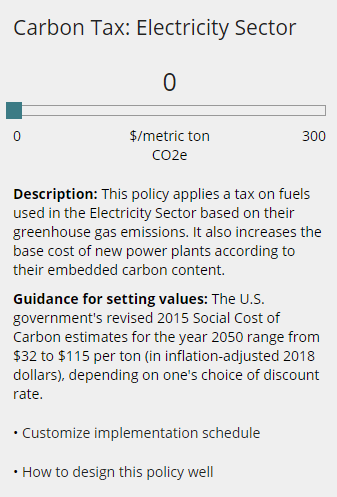 Below that is a slider that allows you to set the carbon tax to any value you desire between $0 and $100 per metric ton of CO2-equivalent. The minimum and maximum bounds appear at each end of the slider, the selected value appears above the slider in the middle, and the units for that value appear below the slider in the middle. As soon as you move the slider and release the mouse button, the new setting for the policy will be applied. The server re-runs the model and updates the graph on the right. The graph is animated: you can watch the line for the active scenario (or all the lines or areas in a multi-variable graph) move from their old positions to their new positions. Depending on your internet connection and load on the server, there may be a slight delay between when you release the mouse button and when you see the graph animate. Note that sometimes a policy change will have no visible effect on the graph, depending on which policy you are changing, how much you are changing that policy, and which graph you are viewing. Below the slider is a short description of the policy. Every policy in the model includes a short description, to help inform users who may be unfamiliar with a given policy. Below the policy description is a small amount of text describing the policy implementation schedule. Not all policies are implemented at the user’s specified setting in the first year of the model run. Many policies are phased in gradually, which reflects a more realistic view of how these policies would likely come into force. The “Implementation Schedule” text reveals that the carbon tax is phased in linearly from 2016 to 2030. This is a period of fifteen years. Therefore, if you set the carbon tax slider to $45, this means that the carbon tax rate in 2016 is $3 per metric ton, in 2017 is $6 per metric ton, and so on, until it reaches $45 per metric ton in 2030. In the downloadable version of the model, policy implementation schedules are fully customizable by the model user. In the online web interface, the user cannot change the default implementation schedule for each policy. Below the implementation schedule is a small amount of guidance text that aims to help the user decide what might be a reasonable value for the policy lever. For example, a user who is unfamiliar with a carbon tax may not have any sense of what constitutes a low, medium, or high value. Accordingly, the guidance text strives to provide a reference point that may help a user decide what numerical setting might be in line with his/her policy preferences. For example, the guidance text for the carbon tax policy mentions that the United States Government’s Social Cost of Carbon estimates for the year 2030 range from $17 to $79 per ton. Next there are two links, “How to design this policy well” and “How the model handles this policy.” The first of these links opens this policy’s page from the Policy Design Guide, a set of short documents that provide advice on how to effectively implement each policy in the model. The second of these links opens a page from the model documentation, where the structure related to the implementation of that policy is discussed. Finally, there is an “OK” button to dismiss the Policy Pane. If your screen is not very tall, it is possible that the “OK” button may be off the bottom of the screen. 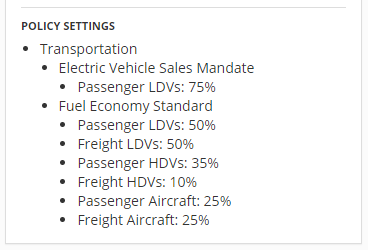 You can scroll the policy pane to bring the button into view. In the lower left area of the screen, below the menus of policy levers, is the Policy Settings box. All of the policy settings for the active scenario are listed in this box. This helps you keep track of the policies that you have added to your policy package and lets you see the contents of a policy package at a glance. If the active scenario has too many policy settings to all be visible in this box, you can scroll the box to bring the rest into view. The button bar is a blue strip that runs across the top of the window. 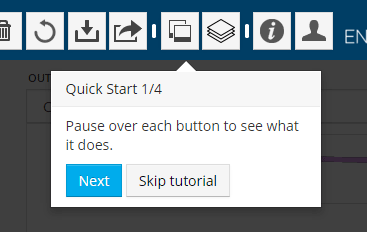 This section will include a picture of each element in the button bar followed by an explanation of what it does. The first six buttons in the button bar provide various functions to manage scenarios (save, rename, delete, etc.). The New Scenario button will create a new scenario with no policies enabled, just like the one that exists when you start the simulator for the first time. The newly created scenario will be selected as the active scenario. If you have an active scenario with unsaved changes, you will be prompted about whether to discard these changes before creating the new scenario. The Save Scenario button will allow you to save your scenario to your account on the Energy Policy Solutions server. If you are not logged into an account, you will be prompted to sign in or to register an account before you may save your scenario. When you save a scenario for the first time, the “New Scenario” name in the graph key will be replaced with the name you choose, and the saved scenario will be assigned a new line color. If you choose the same name as a custom scenario that you previously saved, the simulator will ask whether you wish to replace the previously-saved custom scenario with this scenario. If you have previously saved this scenario under a custom name, and you have since made changes (so the Policy Scenario Selector reads “Your Scenario Name (unsaved changes)”, then clicking the Save Scenario button will simply update that scenario without changing the name, removing the “(unsaved changes)” note from the Policy Scenario Selector. The Save As button will save a copy of the active scenario under a new name. As in the case of the Save Scenario button, you cannot choose any of the built-in scenario names. If you choose the same name as a custom scenario you have previously saved, the simulator will ask you whether you wish to overwrite that scenario. The Revert button will change the policy settings of the active scenario back to the values they had at the last time it was saved (or shared, in the case of a scenario accessed via a URL, as described in the “Sharing Scenarios” section). If the active scenario is a New Scenario that has never been saved, the Revert button will remove all policy settings from the scenario. The simulator will always prompt you to confirm that you really wish to revert before doing so. Clicking on the Download button will cause a .zip file to be downloaded to your computer. The .zip file will contain two or three comma-separated values (.csv) files. One file specifies the names of the policies that are enabled in the active scenario and their numerical settings. Another file provides the numerical values for the data shown on the currently-displayed output graph for the active scenario. If you are currently displaying two output graphs (see the “Multiple Graph Display” section below for details), there will be a third comma-separated values file inside the .zip file containing the data shown on the additional output graph. The Download button is useful if you have developed a scenario and wish to work with the output data in a spreadsheet program, to perform analysis or to create a graph with customized colors or other stylistic elements. Enter your name in the top box. In the second box, enter a list of email addresses (separated by commas) that you wish to receive the scenario. Remember to include your own email address if you would like a copy of the message. Finally, in the third box, you may enter additional text that you would like to appear in the email- for example, you might explain the goal of your scenario. Click “Send” to send the email(s). The email will include a special link that encodes the active scenario’s policy settings into a URL. When the recipient clicks the link, he/she will be taken to the Energy Policy Simulator, and all of the policy settings for the shared scenario will be set automatically. 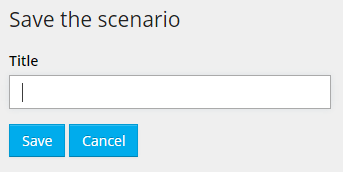 The scenario will be named “Shared Scenario.” Then, your recipient may view the scenario, may edit it, and may save it to his/her own account under a custom name. 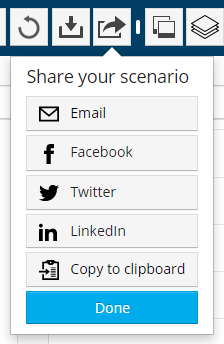 If you wish to share a scenario on a social media platform, simply use the Share button to send an email to yourself. Then, copy the URL from that email and paste it into the social media platform of your choice. The Show Two Graphs / Show One Graph buttons toggle the output graph display between showing one large graph and two smaller graphs, stacked vertically. When you click the Show Two Graphs button, a second graph with its own Output Graph Selector appears below the graph you were already viewing. In the button bar, the Show Two Graphs button changes to the Show One Graph button. Click this button to remove the lower graph. 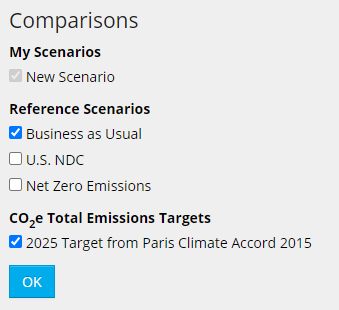 The Comparisons Pane lists the active scenario, any previously saved custom scenarios, the built-in Reference scenarios, and the announced U.S. 2025 emissions target. Each of these elements has a check box next to it. Generally, items that are checked are displayed on the output graph, while items that are not checked are hidden from the output graph. The active scenario is always checked and is always shown on the output graph. You are not able to clear the check box for the active scenario. If you wish to remove it from the graph, first make a different scenario active. If you are showing a multi-variable graph (such as “Electricity Output by Type”), only one scenario can be shown on the graph at a time. The scenario shown on a multi-variable graph is always the active scenario. 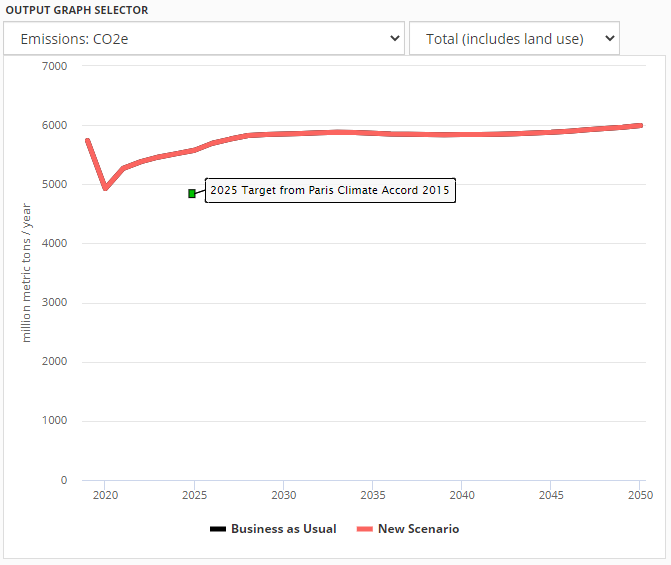 The U.S. 2025 emissions target can only be shown on the “CO2e Emissions (Total)” graph because the target pertains to total CO2e emissions from the United States. If a different output graph is selected, the 2025 emissions target checkbox will be clear, and you will not be able to check the box. When many scenarios are displayed, it can sometimes be confusing which scenario is the active scenario. Remember that the name of the active scenario will always be displayed in the Policy Scenario Selector. The Help button opens the Energy Policy Simulator documentation index page in a new browser tab. 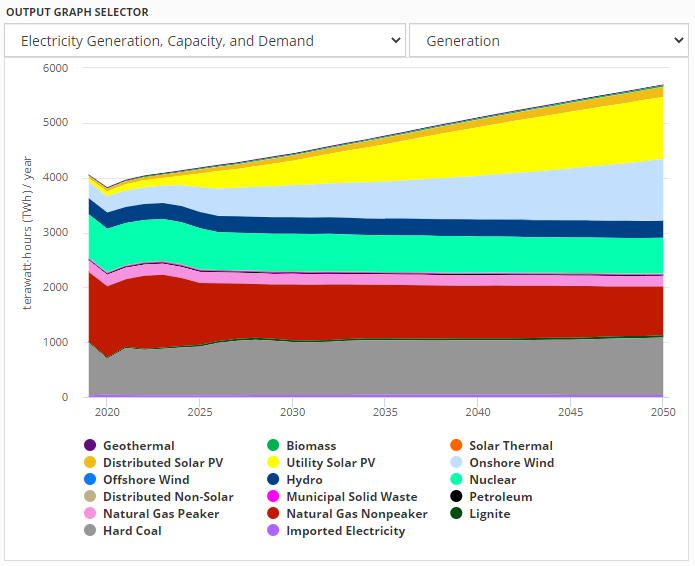 From this page, you can access a great deal of information about all aspects of the Energy Policy Simulator, including this tutorial. If you are not signed in, clicking the Account button will display a small pop-up box with “Sign in,” “Register,” and “Cancel” buttons. 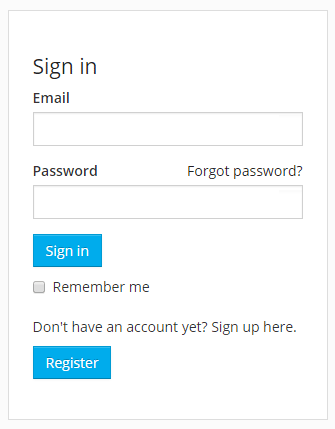 The “Sign in” and “Register” buttons will take you to the log-in page and the account registration page, respectively, while the “Cancel” button will close the small pop-up box. After you sign in, you will be taken to the simulator. Your previously saved scenarios will be available in the Policy Scenario Selector and in the Comparisons pane. 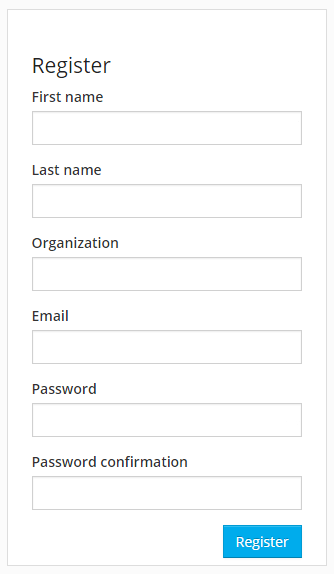 If you are currently signed in, clicking the Account button will display a small pop-up box that informs you of the account under which you are currently signed-in and contains “Sign out” and “Cancel” buttons. Clicking on the “Policy Solutions” logo on the left side of the header bar will open a browser tab showing the landing page for the Energy Policy Solutions project. Clicking on the “Powered by Energy Innovation” logo on the right side of the header bar will open a browser tab showing the home page of Energy Innovation: Policy and Technology LLC, the company that developed the Energy Policy Simulator. You may try to design a policy package that achieves the U.S. 2025 emissions target, either using your favorite policies or low-cost policies. You may look through the policies and enable your favorites at levels that seem wise to you. Once your package has been fully constructed, you check several output variables to see how it performs (for example, in terms of emissions reductions, capital and operational costs/savings, electricity generation by type, etc.). You may choose a goal you care about, such as minimizing fine particulate (PM2.5) emissions or maximizing the amount of installed wind generation capacity. You then switch to the relevant output graph and try to design a policy package that achieves your chosen goal. You may look for policies that have interesting, non-linear interactions. For example, policies that promote wind generation become less effective if the electric grid becomes flexibility-constrained, so a policy like increased electrical transmission capacity (which provides flexibility) has different effects depending on whether or not there are other policies enabled that drive wind capacity growth.